The object of this study is to outline, as straightforwardly as possible, the whole range of the philosophical work of Dr Rudolf Steiner (1861-1925). These works, far ahead of their time, were not widely recognized, and are virtually unknown to modern philosophers. However, Steiner's later works of spiritual science (anthroposophy) and their practical manifestation in many aspects of life, such as education, agriculture and medicine, are gaining increasing interest. In this context, his philosophy, which lays the basis for everything that followed, needs to be widely understood. Since this philosophy is a description of Steiner's living experiences, the author sets it in the context of a brief biography, selected to show how Steiner's thinking developed. 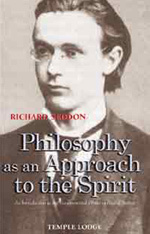 RICHARD SEDDON studied Moral Sciences (Philosophy, Ethics, Logic and Psychology) under Bertrand Russell and John Wisdom - the advocate and colleague of Ludwig Wittgenstein - at Cambridge. This training gave him confidence in his conviction that Rudolf Steiner's resolution of the main problems of philosophy since Aristotle was correct. After half a century's subsequent work in anthroposophy he felt the need for an introductory volume setting out Steiner's own views clearly, without the complications arising from the context of philosophy at the end of the nineteenth century. This book is the result, intended both for students of anthroposophy who have no knowledge of philosophy and for students of philosophy who have no knowledge of anthroposophy.